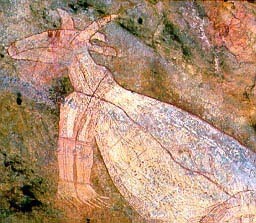 The Northern Territory is remote and sparsely populated and is the region where Aboriginal culture and art is most prevalent. The only big towns are Darwin, its modern tropical capital and Alice Springs in the arid red centre. A single bitumen road, the Stuart Highway connects the two. From Alice Springs it continues on to South Australia. The world famous massive and brilliant red Ayres Rock lies in arid land 400 kilometres from Alice Springs. Not to be forgotten is nearby Olgas rock formation and Kings Canyon a further 300 kilometres. Alice Springs is situated at a gap through the dry MacDonnell Ranges. Along the ranges are chasms, rockpools, gorges and fern filled valleys where intermitant streams have also cut gaps through. 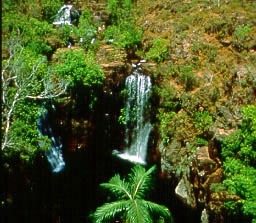 In the tropical north just outside Darwin is the Litchfield National Park on a plateau with waterfalls to the flat plains below. The wetlands of famous Kakadu World Heritage Area is a little further. Further south is Katherine Gorge near the town of Katherine. 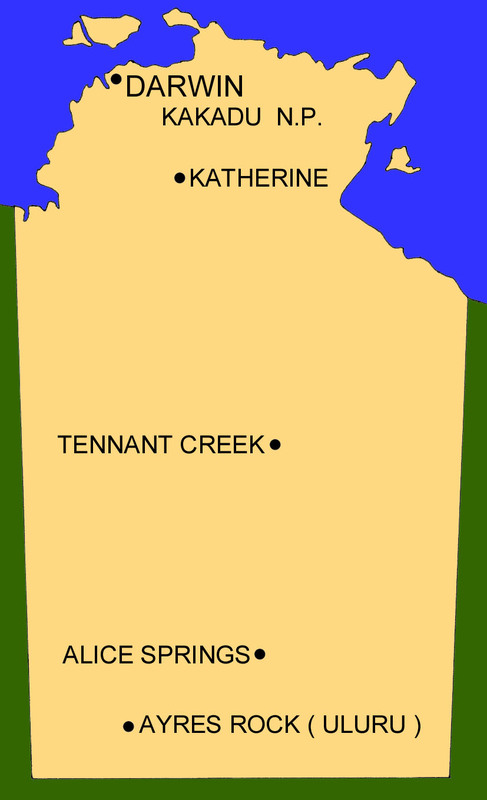 Tennant Creek is yet further south into the dry region. North of town is the road junction for the road to Queensland. Though the distances are long in the Northern Territory, it is blessed with magnificient sights and awesome geographic formations. It still has a frontier feel and the prices are high. 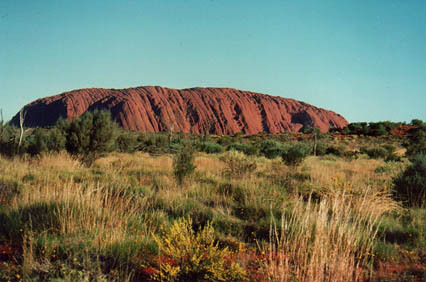 Picture: Ayres Rock. Map: Northern Territory Picture: Litchfield National Park, near Darwin. Refer to our separate Australia wide transport page for detailed routes and timetables. This section is only a summary of services. Buses run along the Stuart Higway from Darwin to Adelaide and beyond to South Australia. Some make the detour to Ayres Rock. Buses also run from Darwin to Threeways junction then across to Queensland. Buses do not neccessarily come every day and connections at Threeways junction are often extremely poor. Darwin, Alice Springs and Ayres Rock have airports. Distances are long. If driving or hiring a car remember petrol stations and supplies are infrequent. Roads off the bitumen are remote. Weather conditions are extreme. Before proceeding off the bitumen take proper precautions and notify police. Copyright (c) 2001 Graham Warren. Backpackers Guide to Australia (TM) is a trademark.